Everyone who stays at Greenbriar Retreat Center is greeted with a warm Welcome Home! Please Call Shop to Sign-up. This camp is for kids ages 8-12. Kids will work on machine as well as hand-work projects. 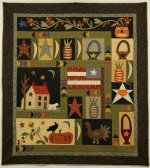 Friday, June 24, 7-9 p.m.
Come and see all the fun and exciting quilts and ideas we found at Spring Market! 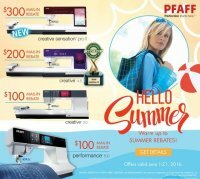 Come by and see our Deals! Saturday, June 11, 1:00 p.m. - 4:00 p.m.
Just like Miss Muffet you can have your very own tuffet; Laura Kay will show you how! Monday, June 13, 10 a.m. - 1 p.m.
Monday, June 20, 10 a.m. - 1 p.m. In this class, MJ will show you how to finish your quilt with show quality binding! 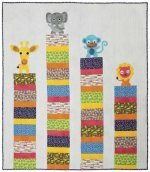 Tuesday, June 14, 10 a.m. - 1 p.m.
Get your quilts show ready! Saturday, June 18, 10 a.m. - 4 p.m. 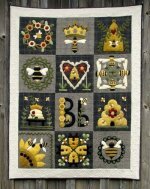 In this class, you will learn the technique and skills necessary to start a punch needle project and have a blast learning it!